I just read your article about the possibility of the Emporium being brought back and I’m excited about that. I only remember the Emporium as being the nice, homey coffee shop that was open in the evenings with live music, before it closed in the ’90s. Anyway, this sounds like a wonderful idea that will be useful for many people and the city. It’s wonderful how people love La Mesa and are reviving it! 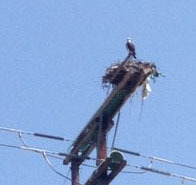 It is distressing to see that the osprey at Lake Murray is using plastic for its nest. I thought that you might want to share this picture with your readers. Maybe someone can do something to alleviate this ugly situation.